Have newly created leads? Processing imported leads from one or more sources? 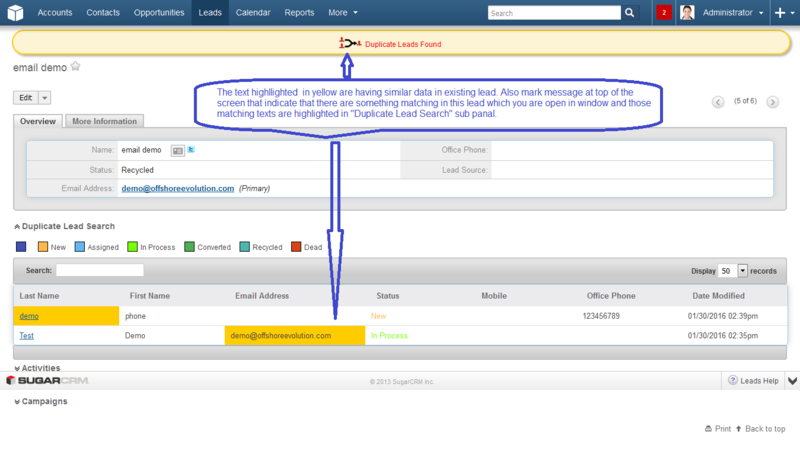 Quickly identify if there is already an existing lead by setting up your predefined parameters. Any possible duplicates will be highlighted and noted when viewing a given lead. Data duplication within your customer relationship management (CRM) system not only irritates users, but it can also waste lots of time and effort along with lost business. Multiple, duplicate calls to the same customer may make your company appear as incompetent. This issue can also potentially lead to sending multiple discounts, emails, etc to the same customer. To solve that, you can stop duplicate data at the time of data entry by using the “Scan Identical Leads” plugin for your CRM application. This add-on provides flexible configurations to quickly identify the identical leads in your customer relationship management system and list them in a sub panel or dashlet.